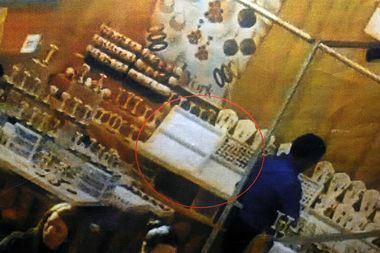 A booth at a high-end jewelry expo of retailers and manufacturers was rifled overnight during three day show. MANHATTAN — In an age where video evidence can play a powerful role in a criminal prosecution, the theft of $250,000 in high-end jewels from one of the nation's largest gem exhibitions seemed like an open-and-shut case. Within hours of the October heist at the Javits Center, the NYPD thought they had their man — an exhibitor with a suitcase caught on surveillance tape after closing time entering and leaving another jeweler's booth where trays of expensive rings and chains were emptied. But prosecutors in the Manhattan District Attorney's office ordered the suspect released, insisting that while the evidence was incriminating, it did not capture the suspect red-handed inside the booth. 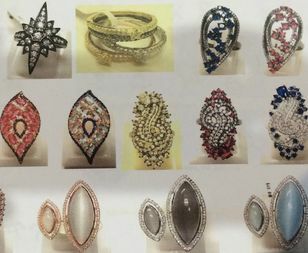 “It’s made me feel like these people don’t really care about anything," Frank Canari, the owner of the stolen jewelry, told DNAinfo New York's "On the Inside." Canari’s nightmare began when he showed up Nov. 1 for the final day of the three-day Jewelers of America Special Delivery Show, pulled back the tarpaulin of his rented 300-square-foot booth and discovered that more than 2,200 silver and semi-precious stone rings, among other items, were missing. The heist was even more astonishing because the event is closed to the public, attended only by licensed jewelry manufacturers and retailers, and every inch of the floor is recorded round-the-clock by a state-of-the-art surveillance system. In fact, many exhibitors believe the security is so airtight that they, like Canari, leave their jewelry in their booths overnight rather than taking the time to lock them in a vault offered by the show organizer. "I was like, how could this happen where $1 billion worth of jewelry is on display and only retailers are selling to one another?" Canari, a veteran of numerous shows, said. NYPD detectives initially were curious if Canari had insurance, thinking perhaps it was an inside job designed to collect on the policy. But when he said he had none, they turned to the surveillance tapes from cameras trained on Canari’s booth and other nearby stalls. They quickly thought they hit pay dirt. Tapes showed a fellow exhibitor was standing around his booth while everyone else was leaving the exhibition. Some jewelry items taken from Javits Center show of high-end sellers. He then was seen walking over to Canari's booth with a suitcase, pulling aside the clamped tarpaulin cover and entering. He emerged 14 minutes later, according to investigative sources familiar with the tapes. He was then recorded walking back to his booth, where he left the suitcase and headed out of the convention center, sources say. The following morning, the exhibitor with the suitcase returned to the center, still wearing the same clothes, at 7:59 a.m. — roughly two hours before the show opened for business. “It is highly unusual for anyone to show up that early when their booths are basically all set up,” an investigative source said. He spent time setting up his booth and then left the Javits at 8:50 a.m. with the suitcase, returning at 9:23 a.m., about 40 minutes before Canari arrived and discovered he was robbed, according to the sources. At 1 p.m., the NYPD arrested the exhibitor on grand larceny charges when he declined to answer questions and the tapes showed that no one else had entered Canari's booth overnight. But seven hours later, the police were told by prosecutors from the Manhattan District Attorney’s office to release him. Prosecutors said that, while the video might be incriminating, there was no footage that showed the suspect taking the jewelry from the trays. “The video tape was not nearly as conclusive as it seemed," said a source familiar with the DA's thinking. “I still cannot believe it,” said Canari, who just returned from spending his Christmas holiday season overseas trying to replenish his lost inventory. Drew Lawson, the show's project manager, said he could not recall an incident like the Javits theft in his 24 years of doing the expo. Meanwhile, the DA’s decision to free the suspect may complicate how the NYPD eventually treats burglars in last weekend's $6 million heist at a West 36th Street jewelry wholesaler. Video captured the trio of hammer-wielding men breaking into the place along with images of their faces. But sources say there may not be video showing them actually grabbing the jewelry, which is what occurred in the Javits case. It has left Canari wondering how they are going to ever charge someone with stealing his jewels.